Jay-Z Wins Best Rap Collaboration – Expanding your culture, one touch at a time. Now you can’t be mad at Mr. Foxx. 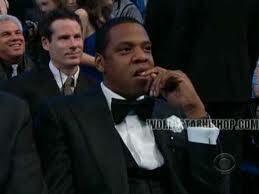 He is simply speaking his mind and Beyonce is easily the BEST BURGAH at the Grammy’s. I mean she could would wear a trash bag full of sardines on the red carpet and still look better than taylor swift….and that’s saying something.